Just what the doctor ordered! As promised, we are back with more goodies from this lovely Chicago Indian wedding. 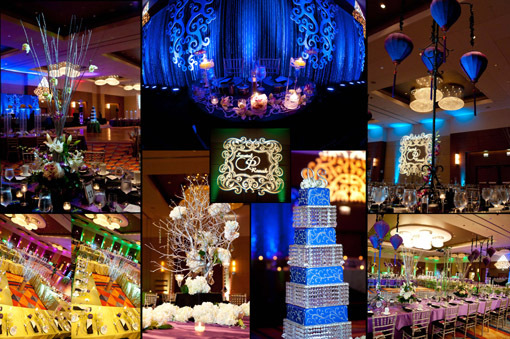 If you though that the ceremony by Elegance Décor was fabulous, you aren’t going to believe your eyes when you see the reception they put together. A royal affair that utilized tons of different ideas, that were all seamlessly put together by the bride and owner of Elegance Décor, Swetal’s, discerning eye. For example their tables, they used a menagerie of round, hollow square, picnic style, X shaped and 3 layer tables. Did you even know there were so many choices when it comes to tables? I must admit that I am quite smitten with the white tuxedo of the groom. It’s something unique and instantaneously you know that the groom, Ronak, has loads of personality. Congratulations to the gorgeous couple and thank you for sharing your amazing wedding with us! Thank you Vendors for your fabulous work on this Indian wedding!